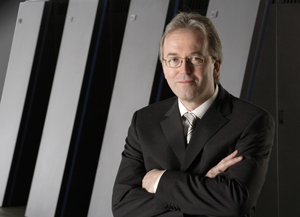 Prof. Dr. Dr. Thomas Lippert, Director of the Institute for Advanced Simulation, Head of Jülich Supercomputing Centre. Just eleven years ago, the first supercomputer, Intel's ASCI Red, broke the barrier of more than one trillion (short-scale number system) floating point operations per second: one Teraflop/s. Last month, a new system at the Los Alamos National Lab, nicknamed 'Roadrunner', achieved for the first time the staggering result of one Petaflop/s or one quadrillion floating point operations per second. Roadrunner was benchmarked through the Linpack benchmark code, which is used to compare and rank the performance of the 500 fastest supercomputers worldwide (http://www.top500.org). The enormous 1000-fold increase in performance of supercomputers in the last eleven years highlights the dramatic progress of these universal instruments. Supercomputers are the base on which has been built the continuous advancement of computer simulations, now a key element in the scientific and industrial competitiveness of knowledge-based economies in the 21st century. Simulations are the engines for industrial fields such as aeronautics, and the automotive, pharmaceutical, oil and financial industries. They drive progress in key scientific fields of the highest societal relevance, like climatology, fusion energy and biology, not to mention the defence sector with its requirement for reliability testing and maintenance of nuclear weapons without the use of nuclear testing. Recently, when speaking at Teratec, the conference on High Performance Computing (HPC) in Paris, the European commissioner for the Information Society, Viviane Reding said "Supercomputers are the 'cathedrals' of modern science, essential tools to push forward the frontiers of research at the service of Europe's prosperity and growth". This statement underlines a strategic emphasis being placed on High Performance Computing across the European Union and investment in selected HPC centres aims to develop many key areas of research and industry. Massively parallel simulations of aircraft wake instabilities. An aircraft wake consists of powerful long-lasting trailing vortices. This potential hazard imposes safety distances, and thus limits airport traffic. 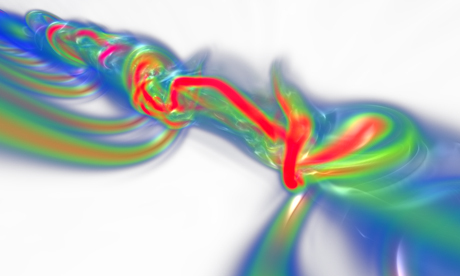 Thousands-of-processors high-resolution simulations can accurately capture fast growing instabilities which perturb the vortices and can therefore accelerate their decay. The figure (also on the cover) shows the volume rendering of vorticity in the case of a fast-growing instability. Secondary vortices generated by the stabilizer reconnect with the wing ones and result in a disturbance that propagates along and inside the vortex cores. Credits: Philippe Chatelain, Michael Bergdorf, Diego Rossinelli, Petros Koumoutsakos, ETH Zurich, Switzerland; Alessandro Curioni, Wanda Andreoni, IBM Zurich Research Laboratory, Switzerland. Acknowledgments: IBM T.J. Watson Research Center, Swiss Supercomputing Center.